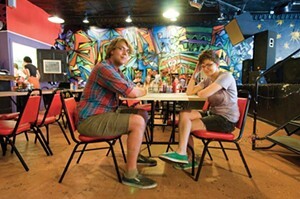 Bobby Pembleton and Jennifer Ward are the general managers of Strange Matter. If you don’t leave a packed show with someone else’s stank on you — you probably weren’t in a small venue. For those who prefer good food, top-shelf alcohol and the sweet perfumes of dancing ladies, Balliceaux works wonders. Promoter Chris Bopst has a rule about booking local and touring acts there: not unless he likes them. Variety, quality music and décor, and a friendly staff make it a no-brainer. Those looking for a more collegiate stank blend — something akin to cheap beer mixed with organic essential oils — should check out Strange Matter, whose rocking bookings of late have strangely started to matter.